Rising interest rates have been a market bogeyman for almost a decade. During that time we’ve gotten pitched all sorts of products that claimed to protect against this. They never seemed to do well, mostly because rates never went up! A couple of years ago that changed. The Federal Reserve has finally moved toward rate normalization and we’re getting the rising rate pitch all over again. Interest rates here in the United States are still very low. Raising interest rates can be a bad thing, but I’m in favor of a modest campaign of slow rate hikes to get back to more normal levels. That is what the Federal Reserve has been doing recently. I like that the movements have been telegraphed well in advance and that the Fed is reducing its balance sheet. When the next recession hits, the United States will be better prepared than countries that grew complacent with rates at emergency levels. When rates rise, bond prices drop. The price of what you hold now goes down because investors can get a similar investment that yields more. The graphic to the left is what should happen. Rates go up, prices go down. The rising rate narrative has provided a great opportunity for money managers to either start new strategies built to counter the threat of rising rates or to market the heck out of their current go-anywhere bond strategies. Do investors need something like this? No, but it’s a story that helps raise assets for fund companies. The savviest of these fund pitches includes a powerpoint slide that shows multiple rising interest rate time periods. The pitched product always looks great, but I leave the manager meetings wondering why none of these rising interest rate funds made it through my screens in the first place. The funds look great during rising rate periods and the Fed has raised rates over the last couple of years. What gives? We see a similar effect when carving out hotel REITs. Hotel REITs hold up well during rising rate periods. Real estate is usually hurt by rising rates, but hotels are different. Because they reset their rent on a nightly basis, hotels should be indifferent to rate changes. Putting hotel REITs into that rising rate powerpoint page from the bond managers shows that this hunch is correct. Hotel REITs do better than a broad REIT ETF during rising rate periods. Holy crap this works. Rates in the United States are low and rising. Certain bond funds and Hotel REITs outperform in this environment. So are we allocating to these strategies now? Positioning bonds for rising rates and buying hotel REITs may outperform when rates rise, but look at the time periods – they’re all really short (less than 3 months). Why didn’t the bond funds pass my general fund screen? They sucked in between these rising rate windows. Hotel REITs are actually a pretty terrible subindex (not to mention there aren’t really any hotel REIT ETFs or funds – you’d need to buy the REITs yourself). If you can’t time rate hikes, returns are less than advertised. In hindsight, it’s easy to see when to get in and out, but it’s impossible to do this in real time with real money. If someone tells you they can do this, they are lying. If they could, they’d be ripping people’s faces off on an institutional bond desk, not chasing mutual fund investors. The counter-intuitive bright side of rising rates is that bond funds benefit in the long run. 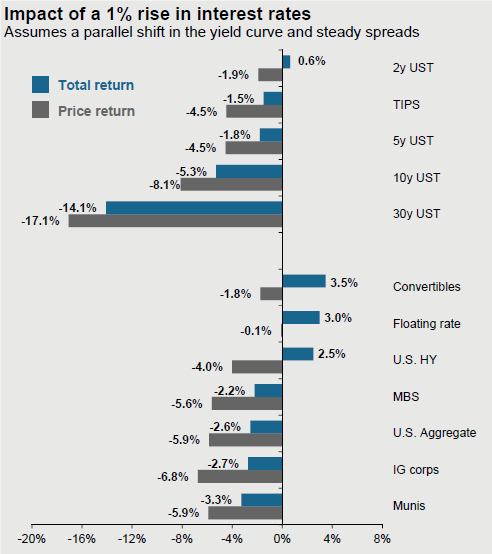 As bonds mature, they can be reinvested at higher yields. If you’re investing for the long haul, you don’t need to change up your bond strategy in response to every FOMC meeting. Bonds are generally a really boring topic and they should be. It can be tempting to ‘just do something’ in the bond space, especially when rates are so low. Trying to squeeze extra yield or capital gain from bonds usually ends up pulling in equity risk – the exact thing bonds should be diversifying away. 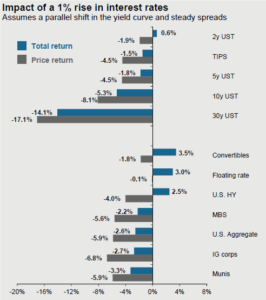 There’s always some headline crying out for investors to change up their allocation (rising rates, geopolitics, etc). However, long term success is derived not from activity, but thoughtful implementation of a plan.